For the second year in a row, Unclutterer is participating in Blog Action Day. This year’s theme is Poverty, and we’re excited to be adding our voice to the discussion. My friend Clark, at first glance, is an all-American man. He’s a little over six feet tall, physically fit, clean shaven, and always dressed in a pressed Oxford shirt and khaki pants. He has a master’s of finance degree from the top-ranked college for such degrees, and if you saw him you would guess he’s 25 instead of 32. Clark used to have a job where he made a hefty six-figure salary and was extremely good at crunching numbers. Then, one day five years ago, he walked into his boss’ office and resigned. A few weeks after he resigned from his job, he donated most of his possessions to charity. He decided he wanted to dedicate his life to helping the impoverished in his community. He only kept a few of pieces of clothing, two pairs of shoes, a few hygiene items, a Bible, and a notebook. Clark found a homeless shelter that needed a day manager, broke his lease on his apartment, and officially changed his residence. A year later, he started a charity in southeast Washington, D.C., and he moved into one of the most crime-ridden, impoverished neighborhoods in the city. Clark and I often have very candid conversations. I asked him once if he thinks a large influx of money would solve the problems in his community. He agreed that it would help some people, but he added that financial poverty is just one of many contributing factors to the current conditions. With time, I’ve come to see what he means by this statement. The people Clark helps on a daily basis have problems that are more complex than needing extra money. Mental illness, drug addiction, failed schools, and hundreds more factors contribute to the problems of impoverishment in the United States. Quitting your job, giving up all of your possessions, and moving into a homeless shelter to work as its day manager is not the path for everyone. It is obviously not the path I have chosen to follow. But, all of us can still find ways to help those in need. We can donate clothing and new or lightly used goods to charity, we can volunteer our time to after-school programs, we can financially support organizations that are helping impoverished communities, and we can ask others to do the same. Good post! And as someone living in the DC area, I’m definitely interested in hearing more about your friend Clark. How inspiring that he changed his life so much to do good. I take issue with the assertion the “a large influx of money” would not solve the problem of impoverished communities. These are obviously complex, multi-generational problems in poor communities. However, the mitigating factors, causing the “impoverishment” of which he speaks, are directly affected by money or its lack: access to health care for those in need, adequately funded schools, after-school care for children (so that their parents may hold jobs), healthy housing at a price poor people can afford, etc. I am so, so, so tired of waiting for charity and volunteering to solve this immense problem in our country. Forgotten communities need more than a few well-meaning volunteers to attend to these issues. This is a national problem of huge scope. Could we please treat it as such? None of my comments are meant to diminish Clark’s good work. @J — Neither Clark nor I would disagree that money would help … I just meant that it will take more than money. Poverty is a bigger issue than money. I hope that even when all of us our tightening our belts, we continue to give financially to those in need, in this country and around the world. While some of us have nothing extra, most of us wouldn’t be reading Unclutterer if we didn’t have too much! I have picked a few charities I am passionate about, and have set up automatic monthly giving in small amounts. It allows me to budget the money over time, and at year’s end its a nice size gift! It also means I don’t have to remember to give. Thanks as ever for a great post and a great blog! i hope it encourages our readers to donate to a charity of their choosing. I agree this is a huge multi-facted problem. Illiteracy, mental illness, culture, chronic physical illness, drug addiction, and more contribute to poor decision making on the part of individuals that impact groups. There are barriers within the agencies we have, some for protection of the very people we are trying to help. An example is a man I’m caring for in hospice, who is homeless. Our social worker is trying to get his Medicaid application completed, and most of the time he is too sick to assist. The Medicaid office called yesterday and asked him for permission to get personal information directly from the social worker. He refused! He was very clear at that time, no case could be made for incompetence, and when he said no there was nothing anyone could do. There are many benefits we could get for him with Medicaid but not without his cooperation. His mistrust of us and of government agencies is the barrier. Kudos to Clark and others like him who work in the field on a daily basis. Yes, I agree with J, it is a national problem, but people like Clark do find that while they can’t tackle the whole nation’s problems, helping one person or one family at a time will make a difference. The HAVE’s really need to help out the HAVE NOT’s. Pass along the no longer wearing business suit and shirt so a man or woman may look a bit polished when applying for a job. Offer money to a park district for the after school program to assist parents who are working for a small paycheck. There are ways to help without having to do it “in person”…cash donations are always welcome, but it’s the people like Clark who are the true heroes in my book. 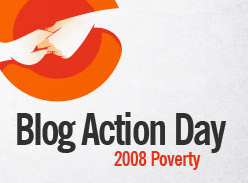 I just signed onto my radio station in Tennessee and say Blog Action day discussing poverty. I work at a faith based-non profit that helps those in need meet basic needs- we are the food pantry for the county, we help with rent, utilities, etc. As parish nurse, I represent over 50 churches that have pledged their support for the ministry. DAILY I speak with someone who is suffering from poverty, lack of money, health issues… etc. I agree with Clark- money is the start to the issue, but not the total answer. I also live in the DC area and am so glad to hear how Clark is so instrumental in improving the lives of so many. I think so much starts at the community level. We can donate money to programs all over the world – US included – but what Clark is doing is far more active. He’s an inspiration. Wow. What an inspiring man. Too bad it’s so easy to become so encumbered by things that are “normal” that we (me included!) become unable to follow the same calling that he did — children, mortgage, etc. @Karen — You’re correct, he does not have a spouse or children. He made the decision to pass on that life (at least for now) to pursue the life he has chosen instead. I don’t know if he’ll ever get married because of his love for what he does. Like I said, it’s not the path for everyone, but it is amazing what he has achieved. Streamlining the system will be a necessity with the future increases in aging population. I’m dealing with a man with schizophrenia who needs a group home desperately. Mental Health services say that the only way to get him one is to take him to the local overloaded ER several times and claim lack of lucidity, then they can check him in, after several unpaid visits, to the state hospital, and after several visits there, they might or might not get him a group home. He is independent most of the time, but wanders off in fugue states, gets caught sleeping out on a park bench somewhere, goes to jail, gets his SSI cut off, and shows up after the jail term needing all services started again. This is the worst of several I deal with. Your friend is a genuine man of courage. I work at a homeless women’s shelter, and I have to say that THE BEST, the most efficient thing you can do to help people in need is to DONATE MONEY to a non-profit organization/charity that you believe to be well run. Seriously, the biggest challenge we in the charity world face is the lack of money to run programs, lack of money to hire competent people and get stuff done… Sure, ‘throwing money at the problem’ alone isn’t going to help… that’s why I stress that you really should look into whether charities are run transparently and efficiently before deciding to give. But the gift of money is probably the most sorely needed and gratefully received. Needless to say, even if you can’t give money (I am ironically in the position of not being able to give much because I make so little working at a nonprofit.. haha), every little bit helps, whether you can volunteer your time or goods. Another really big point I want to make here is: PLEASE think twice about giving away boxes of clothing. Don’t get me wrong; clothes are really important, especially cold weather clothes and such, but people seem to think that they can just throw away piles of dirty, smelly, frankly ugly and totally-last-decade clothes and call it an act of charity. (Um, needy people have standards, too.) Giving away clothes sometimes creates even more a burden for the organization than it helps them… check with the group you want to give to. I was walking around with some friends last weekend and we passed The Harvard Club. I’d heard of it before, but only had a vague recollection of it. I had absolutely no idea that it was here in Manhattan. There was no obvious public entrance. I looked in and looked up at the ostentatious, gold-leafed ceiling and wondered about the history of this place. I’m guessing that Clark is being the change that he wants to see in the world (and I want to commend him for that) but the bottom line is that most of us benefit from poverty. Clark exists among many, many more like him who share his background and who have had similar life experiences, who will never spurn that access and who will do whatever is necessary to ensure that those privileges remain inexorably intact. Clark can return to it whenever he chooses to. Real change comes from a change in moral structure in the home. No drug use, more self discipline, less selfish behavior from the “parents”. More self sacrifice from the “parents” for their children. Marriage and commitment to their family would improve their lives and society’s. That’s real change. That would make a lasting difference. But I don’t get the feeling that’s okay to suggest. Morality is don’t go there subject.